Tarakov 10-40 is a modular freighter with powerful engines. It is widely used as a fast interstellar cargo hauler and an emergency space vehicle. The ship can carry up to four cargo modules, so it’s not typically used to haul bulk cargo, but more precious items instead. Typical cargo can include medical supplies, tools, spare parts, luxuries or valuable ores. 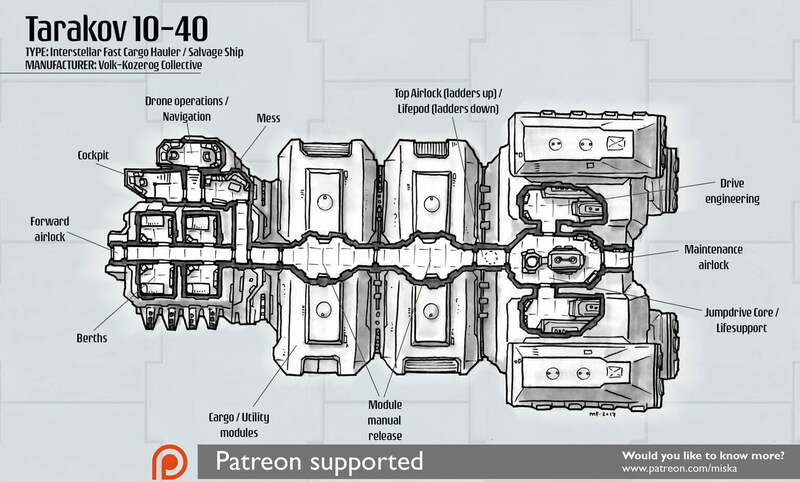 The 10-40 is also often seen in salvage operations as its cargo modules can be exchanged for utility and drone modules and the ship’s powerful engines can easily tug heavier ship wrecks for planetary distances. Usually the wreck is hauled away from debris or asteroid fields to a safer location where the hull is stripped from any salvageable parts and other valuables.